The planet Mars comes in for a close-up tonight, the biggest this world has seen in 15 years. And the observatory at Western University is inviting the public to come in for a viewing. Jan Cami, director of the Hume Cronyn Observatory and an associate professor of astronomy at Western, told CBC's London Morning Tuesday that it's a big deal because Mars will be about 40-million kilometres closer than it comes in other close approaches. "It is significant….If you look at Mars through a telescope, it appears about twice as big now as it would have appeared, say, seven years ago." Cami said Mars is also five times brighter now than it was then. "It's the brightest thing in the sky right now, except for the sun and the moon, of course. And many people have noticed Mars rising in the East." If the weather co-operates tonight -- and it's not looking very good right now – the planet will easy to spot. "There's one very bright orange-coloured star in the sky. It's like a star, but it's a planet. So you really can't miss it. Right now, Mars rises at about sunset, so we typically see it clear some of the trees at about ten in the evening." The weather forecast is calling for cloudy conditions tonight with a 60 per cent chance of showers and the risk of a thunderstorm, and that could spoil the viewing, even with a telescope. 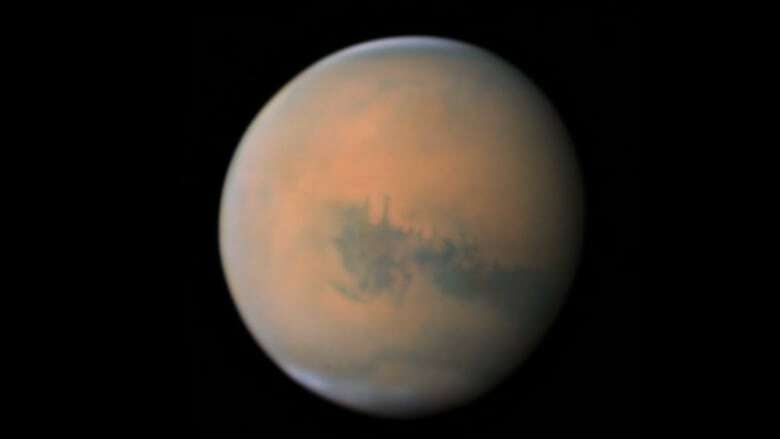 "If it's cloudy, we cannot really use our telescopes to look at Mars. You need special equipment to look through clouds … and we don't have that sort of equipment. So, unfortunately, if it's cloudy, direct observing is not possible." Even if that's the case, the observatory at Western will remain open for presentations about Mars. And Cami said, although the red planet makes its closest approach to Earth tonight, that doesn't mean that tomorrow it won't been seen. "It's going to be a little bit less close but it's still going to be a fairly bright sight in the sky and a fairly big planet in our telescopes." Cami said the advancing approach of Mars toward Earth typically happens about every 17 years, so we won't get another opportunity like this one until 2035. The Western astronomer said Mars always inspires Earthlings because it's our sister planet. And recent research shows it used to be very much like Earth, with oceans covering a large part of it. As for determining whether life exists on Mars, Cami said it won't happen overnight. "It's a process where we do one step at a time. We're not going to send humans there to figure out whether are any living animals, or something. " But NASA is sending a robotic lander to study the interior of Mars. Insight, as it's called, launched on May 5, 2018 and is expected to land on the surface of the planet on November 26. Cami said it will measure the vital signs of Mars, including the seismology and temperature, to figure out its structure and composition.